‘The fact is,’ Debussy once remarked, ‘that the beauty of a work of art will always be a mystery, that is to say that one will never be able to work out “how it’s done”.’ There is no better illustration of the truth of that statement than Debussy’s own Preludes for piano—issued in two books of twelve each in 1910 and 1912 respectively—which so magically and so beautifully evoke sights, sounds and even scents by means of nothing more than what the composer called ‘that box of hammers and strings’. One of the factors involved in converting piano music into authentic orchestral music is that the more varied palette sometimes requires a bigger canvas. Brouillards (Mists) is only a few bars longer in the orchestral version than in the original but the brief extension of the melody that passes from oboe to cor anglais over swirling celesta and harp arpeggios towards the end of the piece gives it the space it needs. Ce qu’a vu le vent d’Ouest (What the west wind saw) was inspired by an account of the adventures of Hans Christian Andersen’s West Wind, the ‘wild boy’ who ‘smacks of the sea’. It is a virtuoso piano piece featuring keyboard devices which would make little sense transferred literally to the orchestra. So, while the harmonies of the first five bars of the orchestral version (before the entry of the chorale theme on trombones and tuba) are implied by Debussy’s introductory arpeggios, the material is actually Matthews’s own. Another creative intervention is a series of horn calls in the central climax of the piece. The protagonists of Minstrels are not medieval troubadors but thoroughly modern black-face entertainers of the kind Debussy is said to have encountered busking in the streets of Eastbourne when he was working on La Mer in 1905. Among the earliest exponents of jazz in Europe, they are celebrated here not so much for their musicianship as for their clowning, as Matthews’s wittily grotesqe scoring acknowledges. In direct contrast, Canope is Debussy’s ode to an Egyptian urn: he was the proud owner of two of the much-prized head-shaped covers of these ancient funerary vessels. Apart from one extra bar where Debussy has a pause, the orchestral version—the chordal procession (recalling Mussorgsky’s Pictures at an Exhibition) on woodwind, the incantatory muted trumpet, the invocations on solo woodwind—is very close to the original. The title of Les sons et les parfums tournent dans l’air du soir (The sounds and the scents dance in the evening air) comes from Baudelaire’s Harmonies du soir, which Debussy had set to music as a song in 1889. Less fragrantly but more helpfully, he might have chosen the next line, ‘Valse mélancolique et langoureux vertige’ ('Melancholy waltz and dizzy languor'). While the change of key from A major to C major for the orchestral version is a purely practical strategy, the comparatively slow tempo applied by Matthews to this 5/4 waltz indulges the poetic languor. La Puerta del Vino—inspired by a picture postcard of a gate in the Alhambra sent to the composer by his Spanish colleague Manuel de Falla—is also transposed into a different key. Whatever the tonality (D flat major for the piano, E flat for the orchestra), the habanera rhythm remains a persistent presence in the bass while the eventful material above it presents what Debussy described as ‘brusque contrasts between violence and impassioned sweetness’. Général Lavine—excentric is another indication of Debussy’s amused interest in the jazz idiom. In this case it is a cake-walk as performed by the American clown Edward Lavine, ‘the man who has soldiered all his life’, at the Théâtre Marigny on the Champs-Élysées in 1910. With the military allusions presented by the trumpets (which are also entrusted with two brief references to ‘Camptown Races’) and a little additional colour here and there, the orchestral version offers a particularly vivid caricature. The title of Feuilles mortes (Dead leaves) is thought to derive from a poem by the composer’s friend Gabriel Mourey including the line ‘Under the cold and melancholy autumn wind’. Its chilly sonorities lend themselves so readily to orchestral treatment that this is one case where the piano original might possibly be reconstructed from Matthews’s score, idiomatically written for strings though it is. In that it is a technical study of the kind that Debussy was to collect in the piano Études three years later, Les tierces alternées (Alternating thirds) is an anomaly among the Preludes. Matthews converts it into a brilliant orchestral scherzo partly by sustaining on bassoons and cellos a melodic line hidden in the pianist’s left hand and partly by introducing subtle metrical variations into Debussy’s regular 2/4. Two bars longer than the original and richer in texture, Matthews’s version of La danse de Puck amounts to a tiny tone poem featuring not only Shakespeare’s sprite but also Oberon, whose presence is signalled by a magical off-key horn call just after the first entry of Puck’s little dance tune on pirouetting flutes. Anyone with an ambition to reconstruct the piano versions would have a better (though still very faint) chance with the next set of arrangements than with those already discussed which, as it happens, include the most radical of Matthews’s departures from the Debussy originals, Le vent dans la plaine and La fille aux cheveux de lin. There is little in the orchestral arrangement of Danseuses de Delphes (Delphic dancers) that is not in the piano material. The economically applied percussion colours, including four notes on crotales, are clearly implied in Debussy’s realisation of the sounds he associated with the three bacchantes carved on an ancient Greek column in the Louvre. The guitar figuration implied by La sérénade interrompue (The interrupted serenade), which is obviously set in southern Spain, is awarded not to a guitar, however, but to plucked strings and a discreetly comic pair of bassoons. Castanets are held in reserve for the second of two intrusions (this one of street musicians from Debussy’s Ibéria) which, to the serenader’s fury, interrupt his soulful flamenco song on woodwind. Des pas sur la neige (Footsteps on the snow) presents a desolate scene. The limping rhythm heard in the opening bars, Debussy tells the hapless pianist, ‘should have the sound value of the depths of a sad and icy landscape’. Perhaps the orchestra has the advantage here in the pinched sound of muted horns and muted trumpet on a chilly background of muted solo violas. Whereas Debussy restricts the dynamic level to pianissimo or piano throughout, after the last rueful entry of the saxophone Matthews allows his muted violins and trumpet a brief forte climax. The next prelude, set in a warmer season, begins before the icy landscape of Des pas sur la neige has quite faded away. Its title ‘Les fées sont d’exquises danseuses’ (‘The fairies are exquisite dancers’) quotes the caption to an illustration by Arthur Rackham for J.M. Barrie’s Peter Pan in Kensington Gardens. The appropriately exquisite piano piece does not, however, translate readily into orchestral terms, mainly because of its often slender (one-line) textures. So Matthews’s slightly longer orchestral version begins in its own way, anticipating Debussy’s opening with idiomatically conceived woodwind figuration and a counterpoint on muted horns and trumpet. This section recurs, after an eventful flight of airborne dances, just before the three-note magic horn call from Weber’s Oberon is heard in the closing bars. A study in floating whole tones, Voiles (either Sails or Veils, but probably the former) is extended by a bar at the end but is otherwise much the same in the orchestral version. Hommage à S. Pickwick, Esq., P.P.M.P.C., on the other hand, adds vivid colour to the Dickensian caricature, not least by making a feature of the side drum—to particularly witty effect in the very first bar, immediately before the mock-solemn entry of the British national anthem on trombone and tuba. La terrasse des audiences du clair de lune, a nocturnal contemplation of the enchanting idea of a terrace for audiences of (rather than in) the moonlight, is as elusive as the Pickwick prelude is robust. Although the title is taken from a newspaper report from India, there is nothing exotic in the music which, indeed, features the French nursery tune, ‘Au clair de la lune’. Heard here on four horns in the opening bars, it signals the beginning of a magically moonlit scene, the light trickling down in woodwind arabesques, one of which Matthews extends before the horns’ final allusion to ‘Au clair de la lune’. Bruyères (Heather or Heath), the Book II equivalent to La fille au cheveux de lin in Book I, evokes from Matthews a similar though less remote reflection, at a not so drastically reduced tempo, on Debussy’s celtic folk-song material. Artfully (if curiously) hiding the opening theme in the scoring for harps at the beginning and for violins on its recall at the end, it luxuriates in a lyrical treatment, largely for solo strings, of the melodic interest that arises in the meantime. Ondine is another Rackham inspiration, the aquatic equivalent of the aerial activity of ‘Les fées sont d’exquises danseuses’. A scherzo based on the central figure, a water nymph, of La Motte-Fouqué’s Ondine, which was published with illustrations by Arthur Rackham in 1912, it is orchestrated here with such panache that it could almost be an arrangement by Ravel. Respighi, another master of orchestration, is called to mind by Matthews’s treatment (transposed from B to C major) of Debussy’s one Italian excursion, Les collines d’Anacapri (The hills of Anacapri). After a short pentatonic prelude, suggestive of distant church bells perhaps, it tries out a tarantella on woodwind, hums a popular song on bassoons and lower strings, and rocks languorously to a kind of habanera on flutes and violins. The exuberant ending, which recalls both the tarantella and the popular song—with recklessly uninhibited horns and trumpets, rumbling tuba, and glittering percussion—is a rethinking and extension of Debussy’s purely pianistic closing section. As with ‘Les fées sont d’exquises danseuses’, an orchestral version of Feux d’artifice (Fireworks) requires textural elaboration of what, particularly in its early stages, is often a single piano line. The last of the 24 Preludes as Debussy presented them, it is a display as much of keyboard fireworks as of the kind of pyrotechnics seen in France on 14 July. Such sensational features as the six-octave glissando at the end of the first section cannot be literally translated into orchestral terms. Much of the sparkling keyboard figuration is retained, however—even, thanks to a virtuoso celesta, in the cadenza that precedes the approach to the explosive climax of the piece. Closing echoes of phrases from ‘La Marseillaise’, on oboe and horn here, confirm the connection with Bastille Day celebrations. Appropriately, because of the stature it acquires in the orchestral version, the last prelude as Matthews presents them is La cathédrale engloutie (The sunken cathedral) based on the legend of the submerged Breton city of Ys whose cathedral can be seen, at the lowest of low tides, to emerge from the mist before being engulfed again. Although Debussy’s mainly chordal material is treated here to a wide range of orchestral sonority, with simulated organ and actual bell sounds as it rises in its modal glory to the central climax, it is not so weighed down as to lose its illusory quality. 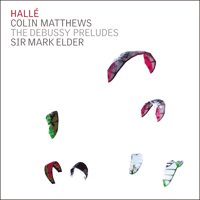 Colin Matthews had always intended to write a postlude to his arrangements of the Debussy Preludes but he waited until he had finished the last of them before he made a start on it. At that point, he says, ‘the only logical thing to do seemed to be to write a piano piece of my own and then transcribe it’. Conceived with a nice sense of authenticity though it was, however, the new piece—which takes its title from the nom de plume Debussy used when working as a music critic in the 1900s—would be quite impossible to trace back to its keyboard origins. The ethereal passage for multi-divided strings about halfway through, for example, would make no sense in piano terms. That is just one of several vividly contrasted episodes which, held together by recurrences of the buzzing activity on trumpets and woodwind at the beginning, make up what Matthews describes as ‘part portrait of Debussy and part expression of exuberance and reflection on having completed the project’. Clearly, he sees Debussy as a man of immense energy but also, as a congenial bassoon and cello melody indicates at an early stage, of immense likeability and, as the string episode seems to suggest, visionary inspiration. In the brilliantly written coda, which has the structural function of tying together the various thematic strands, the sense of exuberance is unmistakable. Closer to Debussy’s own style than Matthews had ‘intended or expected,’ he says, M. Croche ‘was written as a gift and a thank you to Mark Elder and the Hallé, and is respectfully dedicated … à la mémoire d’un musicien français’. «Soutenons, remarqua un jour Debussy, que la beauté d’une œuvre d’art restera toujours mystérieuse, c’est-àdire qu’on ne pourra jamais exactement vérifier «comment cela est fait» .» Rien n’illustre mieux la vérité de ce commentaire que les propres Préludes pour piano de Debussy—publiés en deux livres de douze préludes chacun en 1910 et 1912 respectivement—qui évoquent si magiquement et magnifiquement des images, des sons et même des parfums sans rien utiliser d’autre que ce que le compositeur appelait «cette caisse de marteaux et de cordes». La conversion de pages pour piano en véritable musique orchestrale implique notamment que la palette plus variée de l’orchestre requiert parfois un canevas plus ample. La version orchestrale de Brouillards comporte seulement quelques mesures de plus que l’original, mais la brève extension de la mélodie qui passe du hautbois au cor anglais par-dessus des arpèges de célesta et de harpe tournoyants vers la fin du morceau lui donne l’espace nécessaire. Ce qu’a vu le vent d’Ouest fut inspiré par le récit des aventures du vent d’ouest dans le conte de Hans Christian Andersen, le «garçon sauvage» qui «apporte une odeur de mer». C’est une pièce pour piano virtuose présentant des procédés pianistiques qui auraient peu de sens s’ils étaient transposés littéralement à l’orchestre, aussi, alors que les harmonies des cinq premières mesures de la version orchestrale (avant l’entrée du thème de choral aux trombones et au tuba) sont sous-entendues par les arpèges initiaux de Debussy, le matériau est en fait celui de Matthews. Une autre de ses interventions créatives est une série d’appels de cor dans l’apogée central du morceau. Les protagonistes de Minstrels (Ménestrels) ne sont pas des troubadours médiévaux mais des artistes résolument modernes aux visages d’ébène dont on dit que Debussy les entendit jouer de la musique dans les rues d’Eastbourne alors qu’il travaillait à La Mer en 1905. Parmi les tout premiers représentants du jazz en Europe, ils sont célébrés ici pas tant pour leurs talents de musiciens que pour leurs clowneries, ainsi qu’en témoigne l’orchestration spirituelle et burlesque de Matthews. Apportant un franc contraste, Canope est l’ode de Debussy à une urne égyptienne: il était l’heureux propriétaire de deux des précieux couvercles en forme de tête de ces anciens réceptacles funéraires. À part une mesure additionnelle à un endroit où Debussy marque une pause, la version orchestrale—la procession d’accords (rappelant les Tableaux d’une exposition de Moussorgski) aux bois, la trompette incantatoire avec sourdine, les invocations des bois solistes—est très proche de l’original. Le titre Les sons et les parfums tournent dans l’air du soir provient des Harmonies du soir de Baudelaire, dont Debussy avait tiré une mélodie en 1889. Il aurait pu choisir le vers suivant, moins parfumé mais plus explicatif: «Valse mélancolique et langoureux vertige». Si le changement de tonalité de la majeur à ut majeur pour la version orchestrale est un procédé purement pratique, le tempo relativement lent appliqué par Matthews à cette valse à 5/4 est propice à la langueur poétique. La Puerta del Vino—inspirée par la reproduction sur carte postale d’une porte de l’Alhambra envoyée au compositeur par son confrère espagnol Manuel de Falla—est également transposée dans une tonalité différente. Quelle que soit sa tonalité (ré bémol majeur pour le piano, mi bémol pour l’orchestre), le rythme de habanera demeure une présence persistante à la basse tandis que le matériau tumultueux qu’il sous-tend présente ce que Debussy décrivait comme «de brusques oppositions d’extrême la violence et de passionnée douceur». Général Lavine—excentric est une nouvelle indication de l’intérêt amusé que portait Debussy à l’idiome du jazz. Il s’agit ici d’un cake-walk tel que l’interprète le clown américain Edward Lavine, «l’homme qui a été soldat toute sa vie» au Théâtre Marigny sur les Champs-Élysées en 1910. Les allusions militaires étant présentées par les trompettes (auxquelles sont aussi confiées deux brèves références à «Camptown Races») avec un peu de coloris supplémentaire ici et là, la version orchestrale constitue une caricature particulièrement expressive. On pense que le titre de Feuilles mortes provient d’un poème de l’ami du compositeur Gabriel Mourey. Ses sonorités glacées se prêtent si bien à un traitement orchestral qu’en l’occurrence, l’original pour piano pourrait sûrement être reconstitué à partir de la partition de Matthews, toute idiomatique que soit son écriture pour les cordes. Comme il s’agit d’une étude technique du genre de celles que Debussy allait rassembler dans ses Etudes pour piano trois ans plus tard, Les tierces alternées est une anomalie au sein des Préludes. Matthews transforme le morceau en un brillant scherzo orchestral, en partie en soutenant discrètement une ligne mélodique occultée dans la main gauche du pianiste aux bassons et aux violoncelles, et en partie en introduisant de subtiles variations métriques dans le 2/4 régulier de Debussy. Avec deux mesures de plus que l’original et une texture plus foisonnante, l’adaptation par Matthews de La danse de Puck équivaut à un petit poème symphonique présentant non seulement le lutin de Shakespeare mais aussi Oberon, dont la présence est signalée par un appel de cor faux et féerique juste après la première entrée de la petite mélodie de danse de Puck sur des pirouettes de flûtes. Si quelqu'un ambitionnait de reconstituer les versions pour piano, il aurait plus de chances d'y arriver (mais avec beaucoup de difficultés quand même) à partir des arrangements du CD 2 qu'avec ceux qui sont enregistrés sur le premier CD; en effet, celui-ci contient les transcriptions de Matthews qui s’éloignent le plus radicalement des originaux de Debussy, à savoir Le vent dans la plaine et La fille aux cheveux de lin. Il y a peu d’éléments dans l’arrangement orchestral des Danseuses de Delphes qui ne se trouvaient pas déjà dans le matériau de piano. Les coloris de percussion appliqués avec parcimonie, dont quatre notes sur les crotales, sont clairement suggérés dans la réalisation par Debussy des sons qu’il associait aux trois bacchantes gravées sur une colonne de la Grèce antique exposée au Louvre. Les dessins de guitare évoqués par La sérénade interrompue, dont le décor est évidemment l’Espagne méridionale, sont confiés non pas à une guitare mais à des cordes pincées et à une paire de bassons discrètement comiques. Les castagnettes sont réservées à la seconde de deux intrusions (celle-là due à des musiciens des rues de l’Ibéria de Debussy) qui, à la grande colère du donneur de sérénade, interrompent son éloquente chanson de flamenco confiée aux bois. Des pas sur la neige présente une scène de désolation. Debussy indique au pianiste infortuné que le rythme boiteux entendu dans les mesures initiales «doit avoir la valeur sonore d’un fond de paysage triste et glacé». Sans doute l’orchestre est-il avantagé ici, bénéficiant du son pincé des cors et de la trompette avec sourdine sur la toile de fond glacée d’altos solistes avec sourdine. Alors que Debussy restreint le niveau des dynamiques à pianissimo ou piano du début à la fin, après la dernière entrée chagrine du saxophone, Matthews autorise à ses violons et à sa trompette avec sourdine un bref éclat forte. Le prélude suivant, situé durant une saison plus chaude, débute avant que le paysage glacé de Des pas sur la neige ne se soit entièrement dissipé. Son titre, «Les fées sont d’exquises danseuses», cite la légende d’une illustration d’Arthur Rackham pour le Peter Pan à Kensington Gardens de J.M. Barrie. Toutefois, ce morceau de piano, délicieux comme il convient, ne se prête pas aisément à une transcription orchestrale, principalement à cause de ses textures souvent ténues (sur une ligne). Aussi la version orchestrale légèrement plus longue de Matthews commence-t-elle à sa façon, anticipant sur l’ouverture de Debussy avec des dessins de bois conçus pour être idiomatiques et un contrepoint aux cors et à la trompette avec sourdine. Cette section reparaît, après l’envol mouvementé de danses aériennes, juste avant que l’on entende, dans les dernières mesures, les trois notes de cor magiques de l’Oberon de Weber lancer leur appel. Un traité de tons flottants, Voiles (qui évoque sûrement des bateaux), voit sa conclusion allongée d’une mesure, mais est par ailleurs assez semblable dans sa version orchestrale. Hommage à S. Pickwick, Esq., P.P.M.P.C., quant à lui, ajoute des coloris très vifs à la caricature de Dickens, notamment en distribuant un rôle à la caisse claire—avec un effet particulièrement spirituel dans la toute première mesure, aussitôt avant l’entrée ironiquement solennelle de l’hymne national britannique au trombone et au tuba. La terrasse des audiences du clair de lune, contemplation nocturne de la ravissante image conjurée par le titre, est aussi insaisissable que le prélude de Pickwick est robuste. Bien que ce titre provienne d’un article de journal traitant de l’Inde, il n’y a rien d’exotique dans la musique qui, de fait, cite la chansonnette française «Au clair de la lune». Jouée ici par quatre cors dans les mesures d’ouverture, elle annonce le début d’une scène baignant dans un clair de lune féerique, avec des trouées de lumière dues aux arabesques de bois, dont l’une est développée par Matthews avant l’allusion finale des cors à «Au clair de la lune». Bruyères, l’équivalent dans le Livre II de La fille aux cheveux de lin dans le Livre I, suscite chez Matthews une réflexion similaire mais moins distanciée, à un tempo qui n’est pas aussi radicalement réduit, sur le matériau de chanson populaire celte employé par Debussy. Dissimulant avec adresse (et de manière insolite) le thème initial dans son orchestration pour harpes au début et pour violons lors de son rappel final, le morceau se complaît dans le traitement lyrique de l’intéressante idée mélodique qui se fait jour dans l’intervalle, traitement largement dévolu aux cordes solistes. Ondine est aussi inspiré par Rackham, équivalent aquatique du ballet aérien de «Les fées sont d’exquises danseuses». Scherzo fondé sur le personnage central de l’Ondine de La Motte-Fouqué, qui fut publiée avec des illustrations d’Arthur Rackham en 1912, ce prélude est orchestré ici avec un tel panache qu’il pourrait presque s’agir d’un arrangement de Ravel. C’est à Respighi, un autre maître de l’orchestration, que fait penser le traitement par Matthews des Collines d’Anacapri, l’unique excursion italienne de Debussy—il la transpose de si à ut majeur. Après un bref prélude pentatonique, suggérant peut-être de lointaines cloches d’église, il s’essaie à une tarentelle à la petite harmonie, fredonne une chanson populaire aux bassons et cordes graves, et se balance langoureusement sur une sorte de habanera aux flûtes et violons. L’exubérant finale, qui rappelle à la fois la tarentelle et la chanson populaire—avec des cors et des trompettes étourdis et désinhibés, un tuba grondant et des percussions chatoyantes—revisite et rallonge la section conclusive purement pianistique de Debussy. Comme pour «Les fées sont d’exquises danseuses», élaborer une version orchestrale de Feux d’artifice requiert d’étoffer la texture de ce qui, notamment au début, n’est souvent qu’une simple ligne de piano. Le dernier des 24 Préludes tels que les présenta Debussy porte bien son nom, démonstration de pyrotechnie pianistique qui évoque irrésistiblement les feux d’artifice du 14 juillet en France. Des traits aussi sensationnels que le glissando de six octaves à la fin de la première section ne peuvent pas être littéralement traduits en termes orchestraux. Toutefois, une bonne partie de l’étincelante figuration de clavier est conservée—y compris, grâce à un célesta virtuose, dans la cadence qui précède l’approche de l’explosive culmination du morceau. Dans la conclusion, des échos de phrases de «La Marseillaise», ici au hautbois et au cor, confirment le lien avec la fête nationale française. De manière pertinente, à cause de la stature que lui confère sa version orchestrale, le dernier des Préludes tels que les présente Matthews est La cathédrale engloutie, d’après la légende de la cité bretonne d’Ys, dont on peut voir la cathédrale qui, lors des grandes marées basses, émerge de la brume avant d’être à nouveau engloutie. Bien que le matériau de Debussy, principalement constitué d’accords, bénéficie ici d’un large éventail de sonorités orchestrales, avec simulation d’orgue et vrais sons de cloches tandis qu’il s’élève dans toute sa splendeur modale vers son apogée central, celles-ci ne sont pas assez appuyées pour lui faire perdre son caractère onirique. Colin Matthews avait toujours souhaité écrire un épilogue pour ses arrangements des Préludes de Debussy, mais il a attendu d’avoir achevé le dernier d’entre eux avant de s’y atteler. À ce stade, il déclare, «La seule démarche logique semblait d’écrire mon propre morceau de piano, puis de le transcrire». Malgré le fait qu’il ait été conçu avec un louable sens de l’authenticité, il serait pourtant presque impossible de retracer les origines pianistiques de ce nouveau morceau, dont le titre fait référence au nom de plume utilisé par Debussy lorsqu’il était critique musical dans les années 1900. Le passage éthéré pour cordes en plusieurs divisi vers la moitié du morceau, par exemple, n’aurait aucun sens au piano. Et ce n’est là qu’un seul des divers épisodes vivement contrastés qui, connectés par une ébullition récurrente aux trompettes et aux bois, constituent ce que Matthews décrit comme «en partie un portrait de Debussy et en partie une expression d’exubérance et de réflexion du fait d’avoir mené ce projet à bien». À l’évidence, il voit Debussy comme un homme débordant d’énergie, mais aussi, ainsi que le suggère vers le début une mélodie de basson et violoncelle chaleureuse, quelqu’un d’énormément attachant et, comme semble en témoigner l’épisode confié aux cordes, doué d’une inspiration visionnaire. Dans la coda brillamment écrite, qui a pour fonction structurale de relier les différentes pistes thématiques, le sentiment d’exubérance est franc et massif. Plus proche du propre style de Debussy que Matthews ne l’avait «projeté ou espéré,» dit-il, M. Croche «a été écrit en guise de cadeau et de remerciement pour Mark Elder et le Hallé, et est respectueusement dédié … à la mémoire d’un musicien français». „Tatsache ist“, bemerkte Debussy einmal, „dass die Schönheit eines Kunstwerks stets ein Geheimnis bleibt, will sagen, man wird nie herausfinden können, ‘wie’s gemacht wird’.“ Der Wahrheitsgehalt dieser Behauptung lässt sich nicht besser illustrieren als durch Debussys eigene Préludes für Klavier—herausgegeben 1910 bzw. 1912 in zwei Heften zu je zwölf Stücken—, die mit nichts anderem als dem vom Komponisten so genannten „Kasten voll Hämmern und Saiten“ so zauberhaft und wunderschön Anblicke, Klänge und sogar Düfte heraufbeschwören. Einer der Faktoren in der Übertragung von Klaviermusik in eigenständige Orchestermusik ist, das die größere Variationsbreite manchmal eine reichere Palette verlangt. Brouillards (Nebelschleier) ist in der Orchesterfassung nur wenige Takte länger als das Original, doch die kurze Verlängerung der Melodie, die gegen Ende des Stücks über wirbelnden Celesta- und Harfenarpeggien von der Oboe auf das Englischhorn übergeht, verleiht ihr die nötige Geräumigkeit. Ce qu’a vu le vent d’Ouest (Was der Westwind sah) entnahm seine Anregung aus den Abenteuern von Hans Christian Andersens Westwind, dem „wilden Mann“—„er schmeckt nach der See“. Es handelt sich um ein virtuoses Klavierstück mit pianistischen Kunstgriffen, deren unmittelbare Übertragung ins Orchester wenig Sinn hätte. Während die Harmonien der ersten fünf Takte der Orchesterfassung (ehe das Choralthema auf Posaunen und Tuba einsetzt) auf Debussys einleitenden Arpeggien beruhen, stammt das eigentliche Material von Matthews selbst. Die Hornsignale im zentralen Höhepunkt des Stücks sind ebenfalls ein kreativer Eingriff. Die Protagonisten in Minstrels sind keine mittelalterlichen Troubadoure, sondern ausgesprochen moderne, schwarz geschminkte Entertainer, wie sie Debussy angeblich als Straßenmusiker in Eastbourne sah, als er dort 1905 an La Mer arbeitete. Obwohl sie zu den frühesten Jazz-Interpreten in Europa gehörten, werden sie hier nicht so sehr wegen ihrer musikalischen Fähigkeiten gepriesen, sondern wegen ihrer Clownerie, was auch Matthews’ geistreich groteske Instrumentierung zum Ausdruck bringt. In direktem Gegensatz dazu steht Canope, Debussys Ode auf eine ägyptische Urne: Er war stolzer Besitzer zweier hoch geschätzer kopfförmiger Deckel antiker Totenurnen. Abgesehen von einem zusätzlichen Takt, wo Debussy eine Pause setzt, hält sich die Orchesterfassung—mit ihrer akkordischen (an Mussorgskis Bilder einer Ausstellung gemahnenden) Prozession der Holzbläser, der beschwörenden gedämpften Trompete, den Anrufungen solistischer Holzbläser—ganz eng an das Original. Der Titel Les sons et les parfums tournent dans l’air du soir (Klänge und Düfte tanzen in der Abendluft) entstammt Baudelaires Harmonies du soir, das Debussy 1889 als Lied vertont hatte. Weniger duftig, aber hilfreicher wäre gewesen, die nächste Textzeile als Überschrift zu wählen: „Valse mélancolique et langoureux vertige“ („melancholischer Walzer und taumelndes Schmachten“). Während der Tonartwechsel von A-Dur nach C-Dur für die Orchesterfassung von rein praktischen Erwägungen bestimmt ist, frönt das verhältnismäßig langsame Tempo, das Matthews dem Walzer im 5/4-Takt verleiht, dem poetischen Schmachten. La Puerta del Vino—inspiriert von einer Postkarte mit dem Bild einer Pforte der Alhambra, die der Komponist von seinem spanischen Kollegen Manuel de Falla erhalten hatte—ist ebenfalls in eine andere Tonart transponiert. Ungeachtet der Tonalität (Des-Dur im Klavier, Es-Dur im Orchester) bleibt der Habanera-Rhythmus im Bass durchweg erhalten, während das bewegte Material darüber zum Ausdruck bringt, was Debussy als „schroffe Gegensätze zwischen Gewalttätigkeit und süßer Leidenschaft“ beschrieb. Général Lavine—excentric ist ein weiterer Beleg für Debussys amüsiertes Interesse am Jazz. In diesem Fall handelt sich um einen Cakewalk, wie er 1910 am Théâtre Marigny an den Champs-Elysées von dem amerikanischen Clown Edward Lavine aufgeführt wurde, „dem Mann, der sich sein Leben lang durchkämpfte“. Die militärischen Anspielungen werden von den Trompeten eingeführt (denen außerdem zwei kurze Verweise auf „Camptown Races“ anvertraut sind), und mit ein wenig zusätzlicher Klangfarbe hier und da bietet die Orchesterfassung eine besonders lebendige Karikatur. Der Titel Feuilles mortes (Tote Blätter) geht wohl auf ein Gedicht des mit dem Komponisten befreundeten Gabriel Mourey zurück, mit der Anfangszeile „Unter dem kalten, schwermütigen Wind des Herbstes“. Seine kühle Klangwelt eignet sich so gut zur orchestralen Umsetzung, dass in diesem speziellen Fall die Originalfassung für Klavier womöglich aus Matthews Partitur rekonstruiert werden könnte, obwohl die durchaus idiomatisch für Streicher ausgeführt ist. Insofern es sich um eine technische Etüde jener Art handelt, wie sie Debussy drei Jahre später in seinen Études für Klavier sammeln würde, ist Les tierces alternées (Alternierende Terzen) eine Anomalie unter den Préludes. Matthews verwandelt das Stück in ein brillantes Orchesterscherzo, einerseits indem er diskret eine verborgene Melodielinie in den Fagotten und Celli durchhält, und andererseits durch das Einführen subtiler Abwandlungen in Debussys regelmäßigen 2/4-Takt. Matthews’ Version von La danse de Puck, zwei Takte länger als das Original und strukturell üppiger, kann man als Tondichtung im Miniaturformat ansehen, in der nicht nur Shakespeares Kobold Puck vorkommt (in A.W. Schlegels Übersetzung heißt er Droll), sondern auch Oberon, dessen Auftritt, kurz nach dem ersten Einsatz von Pucks kleiner Tanzweise in den pirouettierenden Flöten, durch ein magisches, aus der Tonart fallendes Hornsignal angekündigt wird. Wer es darauf abgesehen hätte, die Klavierfassungen zu rekonstruieren, wäre mit den Arrangements der CD 2 (ein wenig, wenn auch kaum) besser bedient als mit denen, die auf der ersten CD enthalten sind, denn diese enthält, wie es sich trifft, Matthews' radikalste Abweichungen von Debussys Originalen Le vent dans la plaine und La fille aux cheveux de lin. Im Orchesterarrangement von Danseuses de Delphes findet sich kaum etwas, das nicht im Klaviermaterial enthalten wäre. Die sparsam eingesetzten Schlagzeugklänge, darunter vier Töne auf Zimbeln, sind eindeutig schon in Debussys Umsetzung der Klänge angedeutet, die er mit den drei Bacchantinnen assoziierte, welche auf einer Säule des griechischen Altertums im Louvre zu sehen sind. Die in der offenkundig im Süden Spaniens angesiedelten Sérénade interrompue angedeutete Gitarrenfiguration wird jedoch nicht einer Gitarre übertragen, sondern gezupften Streichinstrumenten und einem diskret komischen Paar von Fagotten. Kastagnetten werden für die zweite der beiden Einmischungen zurückbehalten (diese stammt von den Straßenmusikern aus Debussys Ibéria), die den Zorn des Ständchenmusikers erregen, wenn sie sein gefühlvolles Flamenco-Lied in den Holzbläsern unterbrechen. Des pas sur la neige stellt eine trostlose Szene dar. Der hinkende Rhythmus der einleitenden Takte, teilt Debussy dem unglückseligen Pianisten mit, „sollte vom Klang her an die Tiefen einer traurigen, eisigen Landschaft gemahnen“. Das Orchester ist hier womöglich im Vorteil, steht ihm doch der verkniffene Klang gedämpfter Hörner und gedämpfter Trompete vor dem kühlen Hintergrund gedämpfter Solobratschen zur Verfügung. Während Debussy die Dynamik durchweg auf Pianissimo oder Piano beschränkt, gestattet Matthews seinen gedämpften Geigen und der Trompete nach dem letzten reumütigen Einsatz des Saxophons einen kurzes Forte am Höhepunkt. Das nächste Prélude, in einer wärmeren Jahreszeit angesiedelt, beginnt, ehe die eisige Landschaft von Des pas sur la neige noch ganz verklungen ist. Sein Titel Les fées sont d’exquises danseuses zitiert die Bildunterschrift einer Illustration von Arthur Rackham für J.M. Barries Peter Pan in Kensington Gardens. Das entsprechend exquisite Klavierstück lässt sich jedoch nicht ohne weiteres in Orchesterklänge übertragen, insbesondere wegen seiner oft schlanken (auf eine Melodielinie beschränkten) Texturen. Darum beginnt Matthews’ etwas längere Orchesterfassung auf ihre eigene Art, indem sie Debussys Einleitung mit idiomatisch erdachter Holzbläserfiguration und einem Kontrapunkt auf gedämpften Hörnern und Trompete vorwegnimmt. Dieser Abschnitt kehrt nach ereignisreichen Tänzen in den Lüften wieder, ehe in den abschließenden Takten das aus drei Tönen bestehende magische Hornsignal aus Webers Oberon zu hören ist. Die Studie in schwebenden Ganztönen mit dem Titel Voiles wird am Schluss um einen Takt verlängert, bleibt aber ansonsten in der Orchesterfassung weitgehend unverändert. Hommage à S. Pickwick, Esq., P.P.M.P.C., fügt hingegen der Dickens-Karikatur lebhafte Klangfarben hinzu, nicht zuletzt durch den prominenten Einsatz der kleinen Trommel—besonders witzig im ersten Takt, unmittelbar vor dem gespielt ernsthaften Einsatz der britischen Nationalhymne auf Posaune und Tuba. La terrasse des audiences du clair de lune, eine nächtliche Kontemplation der bezaubernden Idee einer Terrasse für ein Publikum für das Mondlicht (statt nur in ihm), ist so schwer fassbar, wie das Pickwick-Prélude robust war. Obwohl der Titel einem Zeitungsbericht aus Indien entnommen ist, hat die Musik nichts Exotisches an sich; vielmehr greift sie das französische Kinderlied „Au clair de la lune“ auf im Mondlicht, wobei das Licht in Holzbläser-Arabesken herabrinnt, von denen Matthews eine erweitert, ehe die Hörner ein letztes Mal auf „Au clair de la lune“ anspielen. Bruyères, das Äquivalent im zweiten Heft zu La fille au cheveux de lin im ersten, ruft bei Matthews eine ähnliche, wenn auch weniger entlegene Reflexion, in nicht ganz so drastisch reduziertem Tempo, über Debussys keltisches Volksliedmaterial hervor. Es versteckt das einleitende Thema kunstvoll (wenn auch merkwürdigerweise) am Anfang im Harfensatz und bei seiner Wiederholung am Schluss im Violinsatz und rekelt sich in einer wesentlich für Solostreicher gefassten lyrischen Umsetzung des Melodienreichtums, der sich dazwischen auftut. Ondine ist wiederum von Rackham inspiriert, das aquatische Äquivalent zur Aktivität in den Lüften in Les fées sont d’exquises danseuses. Als Scherzo über eine Wassernymphe, die Hauptgestalt in La Motte-Fouqués Ondine (1912 mit Illustrationen von Arthur Rackham veröffentlicht) ist es hier mit solchem Elan orchestriert, dass es sich fast um eine Arrangement von Ravel handeln könnte. Matthews’ Bearbeitung (transponiert von H nach C-Dur) von Debussys einzigem Ausflug ins Italienische, Les collines d’Anacapri, erinnert an Respighi, einen weiteren Meister der Orchestrierung. Nach einem kurzen pentatonischen Vorspiel, das womöglich auf entfernte Kirchenglocken hindeuten könnte, versucht es sich an einer Tarantella der Holzbläser, summt ein volkstümliches Lied in den Fagotten und tiefen Streichern, und wiegt sich verträumt zu einer Art Habanera der Flöten und Geigen. Der überschwängliche Schluss, der sowohl die Tarantella als auch das volkstümliche Lied—mit tollkühn hemmungslosen Hörnern und Trompeten, grollender Tuba und gleißendem Schlagzeug—wieder aufnimmt, ist ein Überdenken und eine Erweiterung von Debussys rein pianistischem Schlussabschnitt. Wie bei Les fées sont d’exquises danseuses erfordert eine Orchesterfassung von Feux d’artifice strukturelle Ausarbeitung dessen, was auf dem Klavier insbesondere am Anfang oft eine einzelne Melodielinie ist. In Debussys Abfolge die letzte der vierundzwanzig Préludes, ist das Werk eine Darbietung pianistischer Pyrotechnik, entsprechend der Art von Feuerwerk, die in Frankreich am 14. Juli zu sehen ist. Sensationelle Merkmale wie das Glissando über sechs Oktaven am Ende des ersten Abschnitts lassen sich nicht unverändert ins Orchester übertragen. Ein wesentlicher Teil der glitzernden Klavierfiguration bleibt jedoch erhalten—dank einer virtuos gespielten Celesta sogar in der Kadenz, die dem Anlauf zum explosiven Höhepunkt des Stücks vorangeht. Abschließende Anklänge an Phrasen der Marseillaise auf Oboe und Horn bestärken noch die Verbindung zu den Feiern am Tag der Erstürmung der Bastille. Wegen der Statur, die es in der Orchesterfassung annimmt, steht La cathédrale engloutie in der Bearbeitung von Matthews an letzter Stelle. Das Prélude beruht auf der Legende der untergegangenen bretonischen Stadt Ys, deren Kathedrale bei besonders niedriger Ebbe aus dem Nebel auftaucht, ehe sie wieder vom Meer verschluckt wird. Obwohl Debussys im Wesentlichen akkordisches Material hier einer Vielfalt von Orchestertimbres ausgesetzt wird, mit simulierten Orgel- und tatsächlichen Glockenklängen, wenn es in all seinem modalen Glanz dem zentralen Höhepunkt entgegenstrebt, ist es doch nicht so überfrachtet, dass es seine illusionistische Wirkung verliert. Colin Matthews hatte von Anfang an vor, ein Nachspiel zu seinen Arrangements von Debussys Préludes zu verfassen, doch machte er sich erst daran, nachdem er die letzte von ihnen fertig hatte. An diesem Punkt, sagt er, „erschien es mir nur logisch, ein eigenes Klavierstück zu komponieren und es dann zu transkribieren“. Doch obwohl es mit einem angemessenen Sinn für Authentizität konzipiert wurde, wäre es ganz unmöglich, das neue Werk—dessen Titel auf das Pseudonym „Monsieur Croche“ zurückgeht, das Debussy in den Jahren nach 1900 für seine Tätigkeit als Musikkritiker benutzte—auf seine Ursprünge als Klavierstück zurückzuführen. Die ätherische Passage für mehrfach unterteilte Streicher etwa in der Mitte ergäbe beispielsweise mit Bezug aufs Klavier keinerlei Sinn. Dabei ist das nur eine von mehreren deutlich von einander abgesetzten Episoden, die durch Wiederholungen der schwirrenden Aktivität der Trompeten und Holzbläser vom Anfang zusammengehalten werden und so ergeben, was Matthews folgendermaßen beschreibt: „teils ein Porträt von Debussy und teils Ausdruck des Überschwangs und der Reflexion beim Gedanken, das Projekt abgeschlossen zu haben“. Er sieht Debussy eindeutig als Mann voller Energie, aber auch, wie eine kongeniale Melodie für Fagott und Cello im ersten Teil andeutet, als ungeheuer liebenswert und, wie die Streicherepisode anzudeuten scheint, als inspiriert und phantasievoll. In der brillant gefassten Coda, die von der Struktur her als Bindeglied der verschiedenen Themenstränge dient, kommt der Überschwang unverwechselbar zum Vorschein. Debussys eigenem Stil ähnlicher, „als ich vorhatte oder erwartete“, sagt Matthews, entstand M. Croche „als Geschenk und Dankeschön an Mark Elder und das Hallé, voller Respekt gewidmet … à la mémoire d’un musicien français“.